The sophomore captain earns his third athlete of the week honor, second this season, after a championship performance at the 2019 Pete Willson Wheaton Invitational. Hernandez went 5-0 as he won the 149-pound weight class; two of those wins were back-to-back victories over ranked opponents. In the quarterfinals, Hernandez defeated long-time conference foe No. 4 Stanley Bleich (Baldwin Wallace) by sudden victory, 3-1, and went on to take down No. 2 Zachary Cooper (Alma) by decision, 6-3, in the semifinals. Hernandez and the No. 7 ranked Purple Raiders tallied 135 team points at Wheaton to win the team title for the first time in program history. 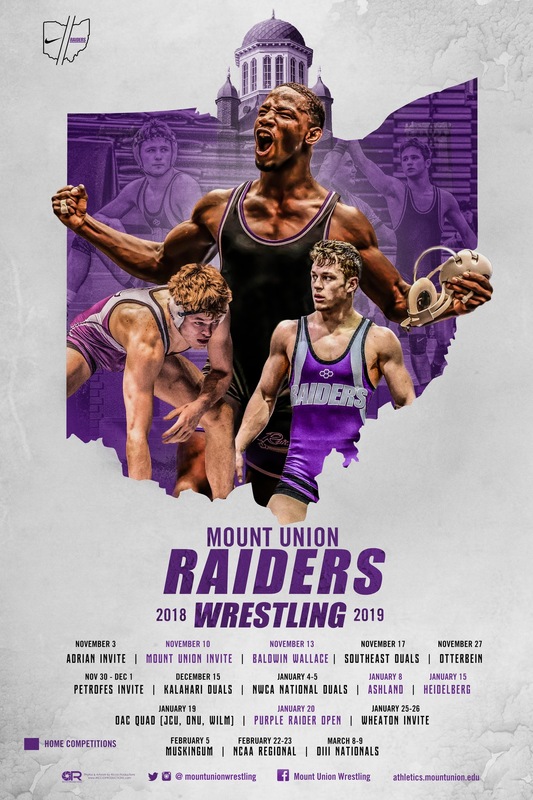 Mount Union returns to the mat for its final dual of the season against Muskingum Tuesday, February 5 at 7 p.m. in New Concord.